Sulfite sensitivity from sulphur dioxide in dried fruits? 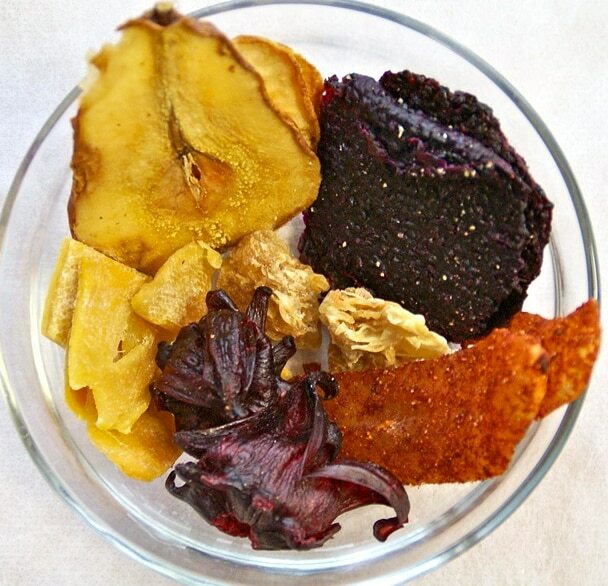 I eat dried fruits (prunes, raisins, apricots and now apples) daily. Please tell me your thoughts about what may be the cumulative effects on an aging body of sulphur dioxide preservatives used in processing fruits for drying. I have been searching the web for more information on sulfites. I have been following a vegan diet for the past 4 years, and my boyfriend has been looking into trying out vegetarianism. Unfortunately he is allergic to sulfites, and so is limited in the foods that he can eat. He says that the biggest thing that is holding him back is the fear of not having enough things to eat to be healthy. I’m not too familiar with sulfite allergies, but I realize that some fruits and vegetables, like onions, grapes, and potatoes may contain sulfites. I would really love any guidance or advice on this subject. I have done my best to help my boyfriend, but I’m afraid my knowledge on this subject is pretty limited, and the research seems to be pretty hard to find. I have never heard of sulfites in the natural foods you mentioned. When I think sulfites I think processed food and preservatives. Dried apricots that are bright oranges (sulfer dioxide), other dried fruits, wine, maybe some packages foods? I think there are plenty of choices out there. If the allergy is serious don’t go eating those foods saying “Joseph told me so” ;) Just double check with his doctor. Then no more excuses time to add more plants into the diet! haha. joking, completely. I am so glad to hear you two are making changes together that is a healthy way to do it! Some research shows men and women are more likely to make a positive health behavior change if their partner does too!